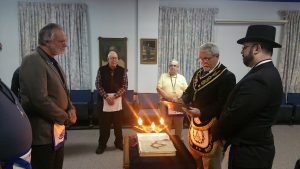 During Gardner Lodges stated meeting on April 5th we were proudly visited by our new DDGM, R:.W:. Cliff Hill. 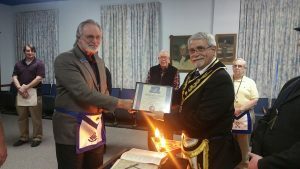 One of the reasons he was there was to present our Past Master Ralph Jensen with the Masters Achievement Award for 2017. A job well done! Brother Dustin Spillman successfully proved up on his Second-degree memory work. His Third Degree ceremony has been scheduled for our very next meeting on April 19th. We hope to have a full house to properly bring Brother Spillman into the Sublime Degree of a Master Mason!